Below are inclusive and cooperative organizations and initiatives that seem to help move toward more peaceful conditions in the region. 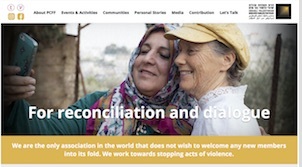 Arab-Israeli Peace Projects – Wikipedia Listing – contains many joint efforts to promote peace in the area. Musalaha.org is a project initiated by an Arab Palestinian. Their executive board has an equal number of people from the Palestinian and Israeli community. They take young adult Palestinians and Israelis into the desert on a journey to discuss and wrestle with discovering peace and respect between themselves.